A new law could put irrigation beyond the reach of most farmers in Vidharbha. Huge hikes in water charges, penalties against farmers with more than two children, and prison terms and large fines for non-payment, all signal the transfer of agriculture to a few rich farmers, observes P Sainath. "So far, farmers without irrigation have been committing suicide," says Vijay Jawandia. "Now irrigated farmers, too, will join them in taking their lives." Jawandia, a kisan leader of Maharashtra's Vidharbha region, says the recently passed Maharashtra Water Resources Regulatory Bill is "simply not workable." The Bill signals huge hikes in water charges and irrigation costs. The Regulatory Authority it sets up will have three full-time members. Not one of them is required to be a farmer. Elected panchayats are sidelined on water issues. Farmers with more than two children will pay one and a half times the high new rates. And in some regions, costly drip and sprinkler irrigation will become mandatory. Breaking these laws invites six months in prison and a fine of ten times the annual water charges. Farmers greeted news of the bill with shock and anger across Vidharbha. This is one of the least irrigated and most backward regions of Maharashtra. One that has seen hundreds of farmers' suicides in the past few years. In Parbhani, Marathwada, the State camp of the All-India Kisan Sabha called for the Bill's repeal. It also declared May 5 as a day of statewide protest to press this demand. No farmer we spoke to in four districts across Vidharbha knew of the Bill. Much less that it had been passed by the legislature. Even Agriculture Department officials seemed baffled by it. "We cannot pay the present charges," says Vijay Kophe of Borgaon village in Amravati district. "How will we pay these new ones? Our water, their taxes?" Kophe owns a little over two acres and has three children. In an already water-starved region, a new law could put water beyond the reach of most farmers. [Picture by P Sainath]. "How many can afford drip or sprinkler irrigation," asks an amazed Gajanand Kumble, another farmer with an even smaller holding. "Where do they think the money will come from?" It will simply "give industry a giant captive market," scoffs Vijay Jawandia in Wardha. "What link is there between irrigation and children," asks Bhojraj Raut, sarpanch of Bathkuli village in Amravati. Labourer Gulabrao Nesram even finds it funny. "What about those with two children but no land? Will they be rewarded?" Like most villages in Vidharbha, this one too, is in the grip of an agricultural crisis and deep in debt. "The village failed to pay electricity bills of about Rs. 1 lakh," says the sarpanch. "So the power was cut off, the pumps are down and we cannot get even drinking water." "Why not fine the government," asks teacher R.M. Bhagywanth. "They have not paid cotton growers here dues of Rs.2,300 crores. How will people pay any bills without that? This law will push up suicides one hundred times." B.T. Deshmukh, an independent member of the legislative council from Amravati, defends the law. He was on the Joint Committee of both houses to which the prickly Bill was referred. After making several changes - and bringing in the two-child norm - the committee approved it. "It has built-in safeguards and protection for poorer regions," he insists. "New irrigation projects must first come in such places. The Governor's directives on these aspects must be observed." And, he points out, "we put in the `principle of equity' into the law." "Those who can pay must do so. There are farmers in some regions who can pay." But he concedes that the rates charged will be the same across the State. Which means many who cannot now afford irrigation, will likely never be able to. Mr. Deshmukh's district has less than four per cent irrigation. 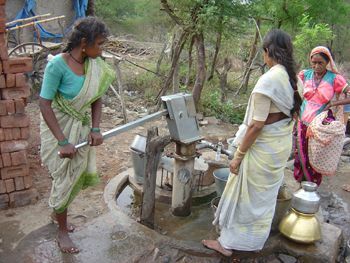 In Talegaon village, Ramesh Ingole used to pay Rs.400 as water charges for his two acres. "Then it went up to Rs.590. For the most recent crop we don't even know how much or how we will pay. If this new law is imposed, we are finished." What would this mean in practice? "If this is the framework, irrigation could cost as much as Rs.8,000 per acre, or more," says Prof. H.N. Desarda, a leading economist based in Aurangabad. Prof. Desarda, a former State planning board member, is also an expert on water issues. "There is no crop in Maharashtra," he points out, "which can sustain such levels of payment." "It means non-irrigated farmers will remain that way for life. Or be forced to quit farming in lakhs," says Anil Tiwari. He is President of the Pandarkauda Municipal Council in Yavatmal. A district with less than eight per cent irrigation. "This simply hands over agriculture to the rich." The poor are not ready to quit, though. "People won't allow this law to function," says Hidayat Khan, a gram panchayat member in Talegaon. In Borgaon, Vijay Kophe is defiant. "Let them send their tax collector. He will be one person. We will be 1500 to resist him."